A new online test is being launched that will help people with asthma gauge to what extent they are at risk from a serious attack. The website will also advise people what they can do to minimise that risk and how to stay well. At the same time a national review of all asthma deaths over the next year is also getting under way. It aims to reduce the number of deaths through asthma attacks, which claim the lives of three people in the UK a day. It asks simple questions about factors which have been linked to increasing the risk of an asthma attack that could lead to a hospital admission. According to the charity Asthma UK, which is behind the new website, about 75% of asthma-related emergency hospital admissions could be prevented. Those taking the test will fall into one of three categories, colour-coded like traffic lights. The red category means the person runs a highly increased risk of a serious attack, while green would mean no increased risk. Each category is linked to advice on how to control the symptoms and what to do if someone does have an attack. Dr Samantha Walker, director of research and policy at Asthma UK, said asthma attacks put someone in hospital every seven minutes and kill over 1,100 people every year. "The test is designed to make people sit up, take notice and make changes to the way they manage their asthma if they are shown to be at an increased risk of an asthma attack. "This kind of test for asthma has never been done before but we're confident it will prove an effective motivator to help reduce frightening and often unnecessary hospital admissions." At the same time the Royal College of Physicians is launching a 12-month review of asthma deaths in the UK. The review will collect details of all asthma deaths from hospitals, GPs and families to try to identify how to improve care and reduce deaths in the future. Dr Mark L Levy, the clinical lead of the National Review of Asthma Deaths, said it was important to learn from every death. 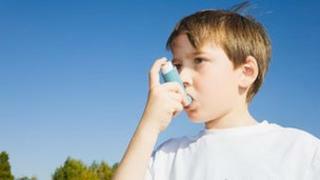 "For 50 years, research has shown that the majority of asthma deaths are potentially preventable. "This first UK National Review of Asthma Deaths offers clinicians and sufferers an opportunity to learn from these sad events and find ways of improving care for people with asthma in the future." Asthma is one of the most common conditions in the UK, affecting around one in 10 children and adults. The Care Services Minister Paul Burstow said: "Asthma can be a matter of life or death. That is why the government is funding this work to help front-line professionals improve the management of the condition. "Led by front-line staff over the next 12 months, staff from across the NHS will be reviewing asthma deaths and collecting evidence which will provide invaluable insights to delivering better care." Neil Churchill, chief executive officer at Asthma UK, said: "The importance of this national review cannot be underestimated. The UK has a higher death rate from asthma than other similar countries and we have been unable to reduce numbers significantly in recent years. "This review will establish any patterns and risk factors that will help us prevent asthma deaths in the future. We're already working with healthcare professionals in key asthma hotspots such as the north-west of England to encourage people to manage their asthma and avoid unnecessary hospital admissions. "The review is a once-in-a-generation opportunity to achieve a step change in reducing deaths and we urge all healthcare professionals to take part."